Are you looking to spice up your winter cross-training? Have you tried vinyasa flows? Vinyasa flows are synchronized breath-to-movement sequences. While a bit outside of the box for more traditional sports training; yoga’s restorative, strengthening and balancing powers may just be the ticket for your next onsite or uber-mountain loop. After my encounter with the mountain lion earlier this year, I took a long break from solo night running. Road running was a poor substitute for the rejuvenating affects of traveling with complete abandon under the stars. So I mostly gave up night running……(for a while). Looking back, I tried to analyze what it was exactly that appealed to me about night running and why had I come to rely upon its medicine. After introspection, it became obvious……two key elements had fueled the driving force behind my night running addiction. For me, these are also the two key elements of a yoga vinyasa flow. After experimenting with a summertime of vinyasa flows (instead of epic hours running) my results have been dramatic. These postures have vastly strengthened my nervous system and improved my overall clarity and sense of well-being. 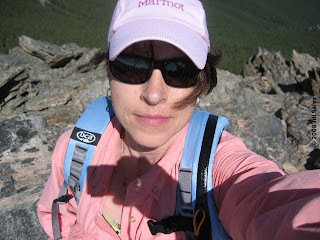 So much, that yesterday I set a personal record when out ticking a few summits. The technical terrain literally “flowed” beneath me. Please feel free to contact me with questions, or for customized training support. Whether your goal is to hike your first 14er or get into technical climbing, I’m always happy to assist you in attaining those goals. 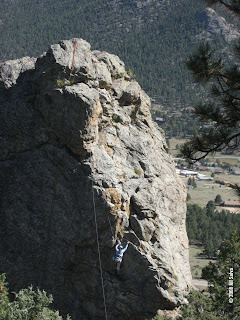 I recently guided a group of young climbers up at the Thumb and Needle crags on Prospect Mountain in Estes Park. 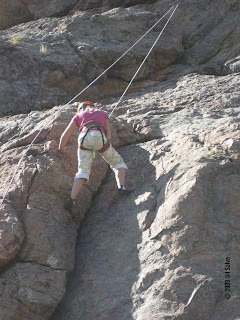 This area is especially suited for beginner and emerging climbers. The routes range between 5.3 on up to 5.11. The short but steep trail approach is enough to quiet even the most loquacious youngsters – but that won’t last for long. Once they drop their packs and gear up, their chatter will swell into the air and focus on who’s going to climb all the way to the top. Something young people tend to do more readily than adults, is work in teams. The kids broke out into small groups for ground school where we taught them how to properly put on their harnesses and helmets. 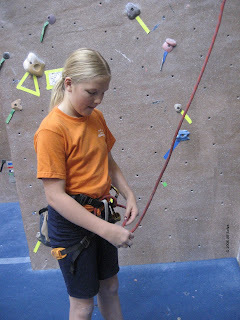 We also taught them how to tie into the rope and safely belay and lower another climber. 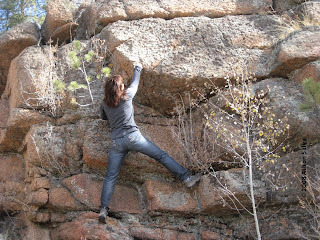 Each student had the opportunity to climb a number of routes. All made it to the top of at least one climb. Most reached the top of several routes. Even kids who were obviously reluctant to be off the ground, gave their best effort to face the challenge square on. One young climber marveled at how “cool” his climbing shoes were. He declared, “These have good “gription”! When I asked him what exactly “gription” meant, he said it meant that the shoes had great grip and friction. Grip + Friction = Gription. 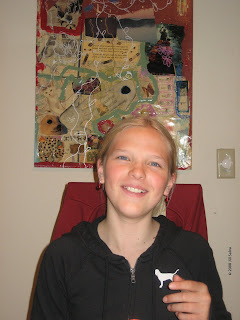 It was obvious more than one kid would include the word “gription” in their daily journal entry. As the small teams of climbers cheered each other on, the day flew by quickly. Before we knew it, the time came to pack up and hike out. Another fun-filled day in the outdoors. Before the birth of my daughter, I had plans for an early retirement in Alaska. I was going to homestead, marry a good man, build a modest home and live off the land in a snowy Shangri-La. The thought of walking into the “big open” and climbing/skiing for days on-end still fills my heart and soul. I’ve often wondered if in a past life I lived in Alaska, perhaps during the gold rush. Alaska isn't the only place there was a gold rush. Colorado has its own gold rush history and lore. I recently spent an afternoon at the Argo Gold Mine and Mill in Idaho Springs. This impressive and historic treasure is a must-see for anyone interested in Colorado mining history. The grounds serve as a graveyard for rusting yet interesting pieces of mining equipment and hulking machines. The grounds also hold one very large stoney meteorite (you can even touch it!) Apparently this rock was found not far from Idaho Springs. 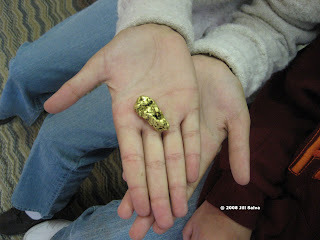 Inside Argo, former miners deliver an hour-long presentation where they pass around gold samples such as the large gold nugget seen in the photo above. They identify more than a doszen minerals and gemstones with tongue-twister names. You get the sense of how hard digging underground for ten hours must have been by viewing a series of old photos that vividly illustrate the conditions workers endured in the mines. After the indoor presentation, you go into the yard and they fired up a huge and L-O-U-D drill. Then you're bused up the hill where you embark on a short self-guided mine tour followed by a walk through the Argo Mill itself. If you stop and close your eyes, you can travel back in time and feel the deafening sound of the mill during its heyday….or imagine the smells and temperature extremes. Once back at the main building, we opted to pan for gold and gemstones. The Argo Gold Mine and Mill Tour is suitable for most ages. Kids under the age of 10 will likely be bored with the indoor presentation, but would enjoy the mine & mill tour as well as panning for gold and gemstones.